← Who Is Divine Mother? “The first step,” replied the Master, “is not to imagine that He wants your definitions. He wants only your love. “Indeed, yes!” replied Sri Yogananda emphatically. “God’s love is already reflected in human relationships. His love, like the sunlight shining on countless pieces of glass, is reflected everywhere. “The Infinite is the Mother behind all human mothers, the true Father behind all human fathers. He is the ever-loyal Friend behind all earthly friends. He is the eternal Beloved behind all human loves. He is all things to all men, because, you see, the Lord is everything. “Through your parents He cares for you, supports you, and protects you. Through your friends He shows you that love is a free sharing, without any hint of compulsion. Through the beloved He helps one to find the selfless intensity of divine love. Through people’s children He helps them to understand love as something precious, as a thing to be protected from harmful influences and nourished with devotion. “Countless are the forms in which God comes to man. In each, He seeks to teach man something of His infinite nature. The lessons are there, for anyone whose heart is open to receive them. “Thus, it isn’t that the Lord wants you to deny your human nature. What He wants, rather, is for you to purify it: to expand whatever love you feel in your heart, and not to keep it locked up in ego-attachments. “For the devotee, it is natural therefore to worship God in some human aspect: as his Divine Mother, for example, or as his Heavenly Father. “I myself worship the Mother aspect, especially. For the Mother is closer than the Father. The Father aspect of God represents that part which is aloof from His creation. The Mother is creation itself. Even among mankind, the human father is more disposed than the mother to judge their erring children. The mother always forgives. “Pray, then, to the Divine Mother. Talk to Her like a child: ‘Divine Mother, naughty or good, I am Your own. You must release me from this delusion.’ The Mother ever responds with compassion when the devotee prays to Her sincerely in this way. “Of course, in the highest sense God is none of the forms in which people worship Him. But it is helpful to use human concepts as a means of deepening our devotion to Him. 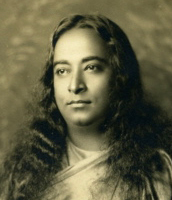 This entry was posted in cosmic mother, divine mother, yogananda and tagged divine mother, yogananda. Bookmark the permalink.